There is a broad consensus that internationalization and innovation are key to the survival and growth of enterprises. “Innovation is the key route to economic prosperity.” Michael Porter, Harvard University. “We will only be able to grow and survive with ideas, not with spending cuts.” Klaus Kleinfeld, President and CEO, Siemens AG. “72% of managers of major companies believe that innovation is among their top three priorities.” Boston Consulting Group Innovation Survey 2010. All barriers should be considered, but perhaps the most important ones are those that arise from the environment in which the business is located. From cultural, economic, institutional or social paradigm. The environment are forming and settling our individual barriers and the ones in our organization. There are environments that crush new ideas, while in others seem to flourish effortlessly. In this context, we can say that there are environments or cultures where innovation is really difficult, just something casual result of the exception. And yet, there are other environments or cultures where innovation is encouraged spontaneously. The Scoreboard European Innovation (Innovation Union Scoreboard. IUS) is an instrument of the European Commission, developed under the Lisbon Strategy to provide a comparative assessment of the innovation performance in Member States. According to the IUS 2014 report by the European Union, Spain occupies a low position in the scale of innovation, falling in the 3rd group, ‘moderate innovators’ of the 4 existing. Thus since there are these statistics and past of European Innovation Scoreboard (EIS), has not progressed. On global scales, with the same parameters, including non EU countries, the European average is 0.63. European leaders are Switzerland (0.84), Sweden (0.75), Denmark (0.72), Germany (0.71) and Finland (0.68). It also compares with non-European examples: South Korea (0.74), USA (0.73) and Japan (0.71). Spain’s relative position has not improved, in contrast, has declined since 2006, with 77% of the average, to 2013 with 75%. During this period (2006-2013) the European average has increased 1.74% and 1.40 Spanish. While other “moderates” like Portugal, Hungary and Lithuania have increased from 2.4 to 3.9%. Since the Spanish position does not improve between 2006 and 2013, but is declining this indicates that the effort in the years of the crisis have not focused on changing the economic model but further penalize facilitators and constraints on innovation. The private sector does not invest. Private investments in innovation are 3 times lower than in leading countries and 1/2 of the mean, both R & D investment and innovation than R & D. Public investment is somewhat higher but unfocused and disconnected from the companies. Business Model. It is not recognized or does not sufficiently recognize the model of competitive and innovative and come forward to participate in the global arena business initiatives. In contrast, many major companies have emerged and they work with a model of proximity to political power, either by their source public monopolies, or by an intrinsic model, based on the concessions and agreements with administrations. The education system. Education is a strong barrier that places human resources below the countries of the European environment. It is not results-oriented and innovation. There is a strong difference in the rate of population last year of secondary education (20-24 in.) And the number of doctorates. The University has been an increase in the number of submissions, but are not reflected in patents. Innovative initiatives are limited to the professions, medicine, design, etc. There is a growing trend that better educated people have to seek employment abroad. Economic Model. Still no change an economy or an economic model that can sometimes grow, but can not grow well, ie, based on non-productive assets or resources, land, buildings etc. or strategies that do not create value, and compete only on price, lower personnel costs, extensive use of resources, environmental damage, production in mature or declining phases, speculation etc. This, already anticipated in 2005, has still not been changed, nor are there signs that attempt during the following years. Financial Structures. Clearly there is a desire to modernize the financial structures be based on support of the productive economy. Therefore financing systems for businesses, nor the existence of venture capital for business startups both initiatives, and innovative initiatives or application of technological advances are not developed. Venture capital and entrepreneurial support systems is very poor or non-existent in some areas. SMBs. SMEs are not sufficiently connected and do not invest neither separately nor in the form of partnerships or collaborations in innovation. In many cases the culture is competing on price and locally. Therefore, the total% of innovative SMEs cooperating or alliances with others is so low and SMEs are in a position to delay the introduction of product innovations or process innovations in marketing or organization. Nor are there adequate funding systems. Intangibles are not valued. There is a lack of valuation of intangibles in general and worst assets by managers, probably due to the business model oriented to short-term or price competition. Not only are there a number of patents significantly below our environment, but also, there is also an assessment of the marks or designs in general, little is valued intellectual capital management systems, organizational and relational assets. 8. Opening to the outside. Many companies do not have a culture of openness to the outside, not into new markets, or collaborations or partnerships or just customer orientation. Rates collaborations clients with new projects is significantly lower than in Europe. 9. Connection between companyies and science/technology now missing. 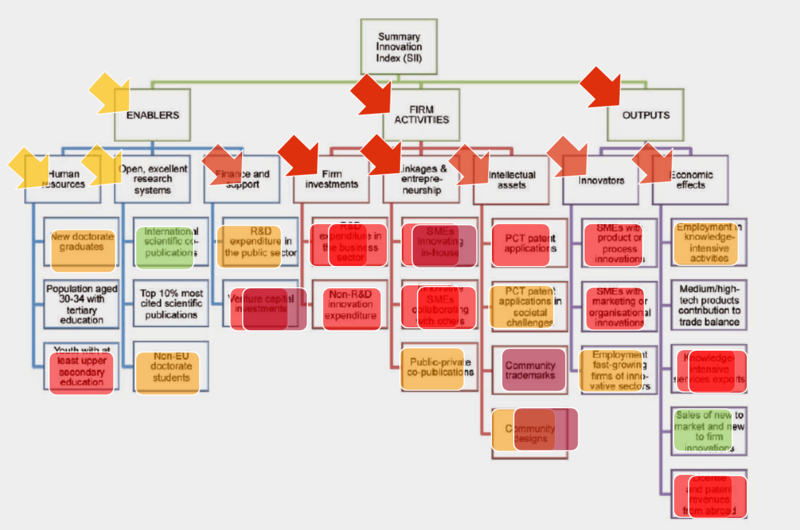 Few public, private or mixed institutions, associations, groups (clusters) act as promoters of innovation being bridges between research and technology base and business. What to do with so many barriers? Even with all the external barriers and the environment, a company can be innovative and be a model internationally. Next Post Agile innovationProductive economyStart up, entrepreneursVision & strategy	Can we enhance productive economy?